I wrote this poem, “Someone Who Cares,” around 2004 to be included in my second published novel by BET Books, “A Test of Faith” (released April, 2005.) I’ve also made it part of my Zazzle greeting card collection. In the book, my main character Andrea finds herself consumed with grief and despair when her beloved husband Clayton is killed by a drunk driver. One of her dear friends gives her a card that contains the poem. The poem is also near the front of the book before the story begins. Losing a loved one to death is the most tragic and painful heartache we can ever experience. Yet, not everyone grieves in exactly the same way. During this time, it is important that we have family and friends by our side to help us through the process of bereavement. Sometimes, however, even in the midst of such support, our sorrow may cause us to feel lost and alone. Even with the support of her devoted family, this is how Andrea feels as she is being tested in so many ways. But with the progression of time, she wrestles with her sadness, anger, and faith–one day at a time. 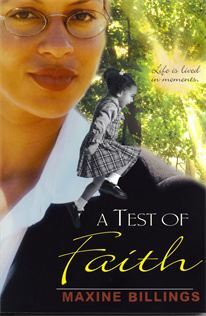 “A Test of Faith” is now out of print. However, you can still order a paperback copy via Amazon. Why not order one for yourself or someone else? Also, if you like it, I would greatly appreciate your writing a review on Goodreads and/or Amazon. Categories: books, greeting cards | Tags: A TEST OF FAITH, Amazon, anger, art, authors, bereavement, BET Books, book review, books, care, characters, comfort, death, despair, devotion, drunk driver, emotional health, emotional support, encouragement, faith, family, family books, family drama, family fiction, family reading, family relationships, feelings, fiction inspiration, fiction inspirational novels, fictional character, Goodreads, greeting cards, grief, grieve, grieving, heartache, inspiration, Maxine Billings, mental health, Nature's Finest by Maxine Billings, novels, out of print, paper books, paperback, poems, poetry, reading, relationships, sadness, sorrow, support, wholesome books, wholesome reading, writing, Zazzle | Permalink. We need our power, strength, and energy in order to keep going in this troubled world we live in. We all struggle with negative feelings from time to time. But prolonged negative emotions can zap us not just mentally and emotionally but physically and spiritually. They can also cause us to do and say things that we ordinarily might not. 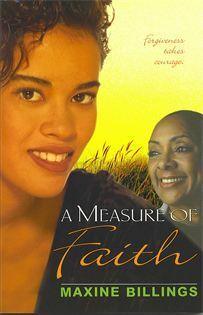 In my first published novel, A MEASURE OF FAITH, this is what happens to Lynnette. Initially, she cannot see the light at the end of the tunnel and is so wrapped up in herself and what she’s going through that she spends the majority of her time wallowing in self-pity. Have you ever had a friend who was plagued by a personal trial to the point of constantly whining and complaining so much that you just wanted to shake them–not in a bad way–but in a good way because you love them and hate to see them suffering? As imperfect humans, all of us can become overwhelmed at times from feelings of discouragement. However, some of us are more prone to a higher level. Stress coupled with prolonged negative emotions can affect the body and contribute to a chemical imbalance in the brain of some people, thus producing depression. This is the case with Andrea in A TEST OF FAITH. 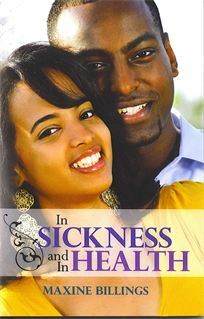 Darryl of IN SICKNESS AND IN HEALTH experienced a temporary bout with depression. Categories: Uncategorized | Tags: A MEASURE OF FAITH, A TEST OF FAITH, adversity, battles, brain, chemical imbalance, comfort, depression, discouragement, emotional health, empathy, heartache, hope, IN SICKNESS AND IN HEALTH, mental health, mental illness, negative feelings, pain, physical health, power, self-pity, spiritual health, stress, struggles, suffering, trials, tribulation | Permalink.